Public protector Thuli Madonsela yesterday told the provincial government her office was investigating 1,800 complaints across the Western Cape. Madonsela also briefed Premier Helen Zille and provincial leaders on findings at public health facilities in the province. He office could not confirm last night exactly how many health-related cases they were investigating in the province. Madonsela said her team wanted to “raise the blind spots”. They found a shortage of chronic medication, patients waiting for ambulances and other services and language barriers at one facility that could lead to misdiagnosis. Zille retorted that locals should not rely solely on ambulances to get them to hospitals though. She said patients should also get their families to take them to hospitals or clinics instead of waiting for ambulances. “That’s a very normal thing,” said Zille. Madonsela said those in charge of ambulances should not tell patients “take your own transport”. Madonsela said her office would issue a full report to the provincial government detailing findings of its site visits and public meetings in July. They found locals complaining about a “shortage of ambulances and medicine at Phola Park clinic in Paarl”. Her office said they would also investigate “allegations of ill treatment of patients by staff, long waiting queues, shortage of drugs and in some instances, racism”. Provincial health minister Theuns Botha said at Madonsela’s briefing last night most complaints were a “simple problem of communication”. Theuns said his department had partnered with private doctors and clinics to deliver public health services. “If we add 100 private (doctor’s) practices then these people (patients) are not in our facilities,” said Botha. He said this would reduce waiting times at public health facilities. “We are doing everything to reduce waiting times. Ninety percent of our problems relate to waiting times,” said Botha. Zille explained that chronic medication delivery to patients had been outsourced to small businesses in various townships. This obituary was published in the Weekend Argus weekly regional newspaper in the Western Cape on September 8 2013. Community leader Sheikh Abduraghiem Hasan Sallie’s prolific pen ran dry a week ago when he passed away aged 69. 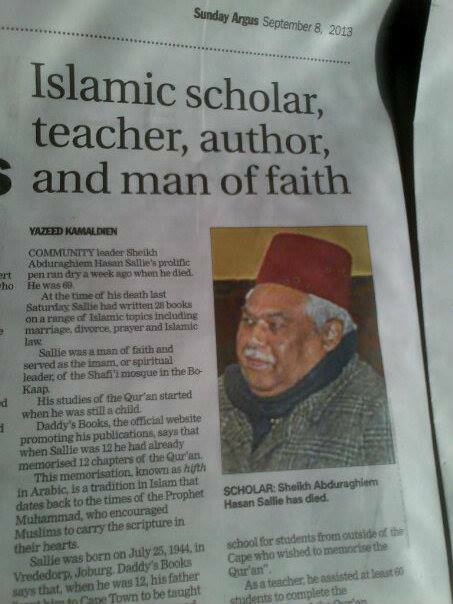 By the time he took his final rest last Saturday, Sallie had authored 28 books about a range of Islamic related topics. This included unpacking marriage, divorce, prayer and Islamic law. Sallie was a man of faith and served as the imam, or spiritual leader, of the Shafi’i Mosque in Bo-Kaap. His studies of the Qur’an, which Muslims believe to be the word of Allah or God, started when he was still a child. Daddy’s Books, the official website promoting his publications, informs that when Sallie was 12 he had already memorised 12 chapters of the Qur’an. This memorisation, known as hifth in Arabic, is a tradition in Islam that dates back to the times of Prophet Muhammad who encouraged Muslims to carry the scripture in their hearts. Sallie was born on July 25, 1944, in Vrededorp, Johannesburg. Daddy’s Books informs that when he was 12 his father “sent him to Cape Town to be taught by well-known Sheikh Muhammad Salie Abadi Solomon”. Two years later he traveled to Mecca, Islam’s city of pilgrims in Saudi Arabia, to study for two years. Sallie spent years learning and understanding Islam and remained a perpetual student. When he was 50 he traveled to Egypt to pursue further studies, leading to the publication of book he co-authored on inheritance in Islam. His written contribution towards the library about Islam stands out beyond South Africa’s borders though. In the mid-1990s he was the author of a regular Questions of Faith section interacting with readers about Islam in Saudi Gazette, the largest English-language newspaper published in Saudi Arabia. Sallie’s voice meanwhile reached the homes of South Africans of various faith persuasions. He shared his knowledge on Cape Town Muslim broadcaster Radio 786 via a fortnightly programme about maintenance and child-care. He also spoke to the Afrikaner community via Radio Sonder Grense, or Radio Without Borders, with the first programme about Islam on this SABC station. His RSG show was called Islam in Fokus, launched in 1996 and ran for a number of years. Sallie’s passion was teaching Islam and he used various platforms to achieve this goal. Daddy’s Books informs that he established a “wealth of educational institutions especially in the impoverished areas, including a boarding school for students from outside of the Cape who wished to memorise the Qur’an”. As a teacher, he had assisted at least 60 students to complete the memorisation of the Qur’an. The Muslim Judicial Council, which governs Islamic affairs in Cape Town, said in a tribute after his death that locals would “continue benefiting from the sheikh’s knowledge through his valuable literature and his dedicated students”. Sallie served on the MJC and its members reportedly visited his home a few weeks ago as he was battling motor-neuron disease. This rare condition damages parts of the nervous system and causes progressive weakness, usually with muscle wasting. Thousands of Muslims attended his funeral and burial in Cape Town last Sunday. Tributes followed on radio stations, in newspaper articles and websites. He was remembered for encouraging others to “love the Qur’an”. He was also remembered for his “concern about orphans and impoverished communities”. Sheikh Yusuf Agherdien, who served as the deputy imam at Shafi’i Mosque for 24 years, told Channel Islam International radio station based in Johannesburg that Sallie “was an avid reader… constantly upgrading himself”. Agherdien assisted Sallie with the production of his publications and will now take over his duties as imam of the mosque. Sallie is survived by his wife Maymoena, four sons and one daughter.